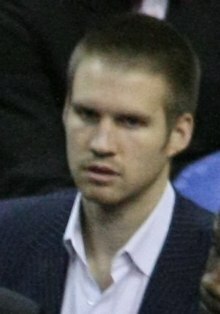 The 2012–13 CBA season was the 18th CBA season. This season began on November 24, 2012. + Including players from Hong Kong and Chinese Taipei. ++ If teams waive their rights to sign the extra Asian player, they may use foreign players for 7 quarters collectively. +++ Only 1 allowed in the 4th quarter. 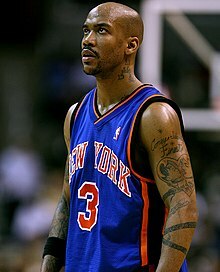 Former New York Knicks player Stephon Marbury was voted CBA Foreign MVP. 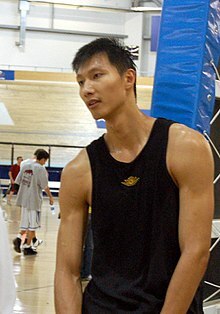 Yi Jianlian led his team to the playoffs, and to its 8th title, and was also voted CBA Domestic MVP. The following players were named the Domestic and Foreign Players of the Week. ^ "CBA首轮转播-关注CCTV5看麦蒂首秀 老马PK大将军". Sina Sports. 2012-11-20. Retrieved 2012-11-24. ^ "解读CBA新规则:打八一减少外援数 增加转播机位". China Daily. 2012-11-22. Archived from the original on 2013-01-01. Retrieved 2012-11-24. ^ "Chinese CBA News, Rumors, Roster, Stats, Awards, Transactions, Depth Charts, Forums - RealGM". Archived from the original on 2013-07-15. Retrieved 2013-07-01. ^ "CBA第一周MVP公布:山西查尔斯和广东易建联当选". 搜狐体育. 2012-12-07. Retrieved 2013-03-03. ^ "CBA第二周MVP：易建联蝉联本土最佳 海尔斯当选". 搜狐体育. 2012-12-13. Retrieved 2013-03-03. ^ "CBA第三周MVP：西热力江携山西威廉姆斯获殊荣". 搜狐体育. 2012-12-20. Retrieved 2013-03-03. ^ "CBA第四周MVP：查尔斯二度当选 王治郅力压刘炜". 搜狐体育. 2012-12-27. Retrieved 2013-03-03. ^ "CBA联赛第五周MVP:山西查尔斯和广东易建联当选". 搜狐体育. 2012-12-31. Retrieved 2013-03-03. ^ "CBA第六周MVP：易建联再获殊荣 杜比成外援NO.1". 搜狐体育. 2013-01-09. Retrieved 2013-03-03. ^ "CBA第七周MVP：马布里首获殊荣 易建联轻松蝉联". 搜狐体育. 2013-01-17. Retrieved 2013-03-03. ^ "CBA第八周MVP：阿联连续四次当选 海斯利普获奖". 搜狐体育. 2013-01-21. Retrieved 2013-03-03. ^ "2012-2013CBA联赛第10周MVP评选结果". 搜狐体育. 2013-02-08. Retrieved 2013-03-03. ^ "2012-2013CBA联赛第十一周（第32-34轮）MVP评选结果". 搜狐体育. 2013-02-20. Retrieved 2013-03-03. This page was last edited on 26 March 2019, at 11:47 (UTC).